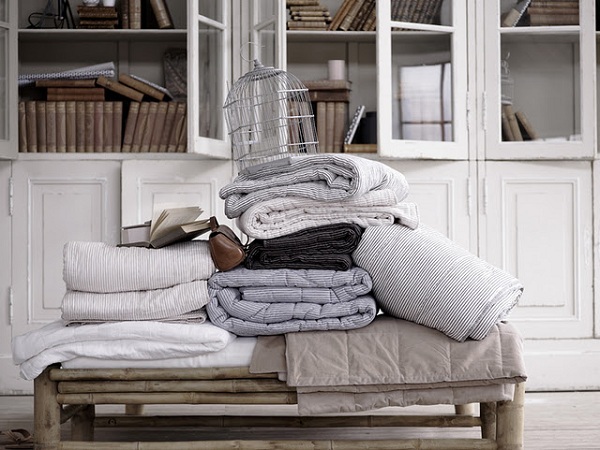 Spring has come with the new PURE collection from Danish company Tine K Home. I was delighted this morning to find in my mailbox amazing pictures from their Swedish showroom, an old ceramic factory in Höganäs, where Tine K team created a springlike atmosphere to present the new collection. I love the crisp and rough look of their home and lifestyle accessories, that include cushions, quilts, linens, lamps, ceramics, glass and more. Lots of whites and smokey grays in the new collection with hints of blue for a stylish look that never feels cold. All the more when the products are presented in that gorgeous open space with white washed beams and together with antique looking furniture! If you haven’t seen yet the new Tine K Home catalog, below is a selection of beautifully styled pictures, plus some shots from the Höganäs showroom for a taste of spring!